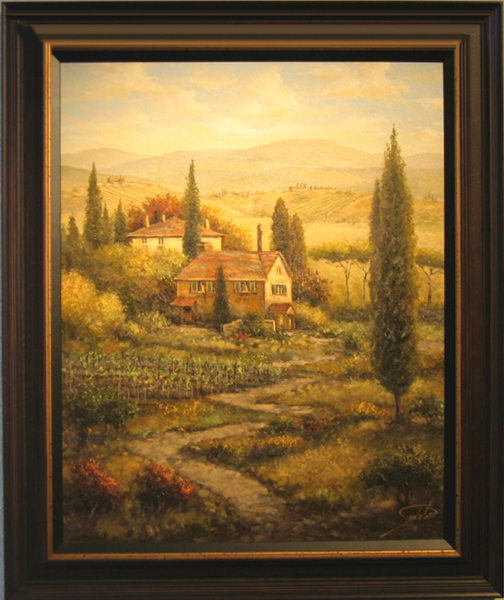 Oil impressionist Joe Sambataro was born in Philadelphia, Pennsylvania in 1947 and attended the Philadelphia College of Arts, and became an honor graduate of the famous Layton School of Art. In addition, he received academic degrees from Marquette University. At 15, Sambataro won his first of many major awards and has himself become lecturer and judge for art leagues, juried contests, exhibitions and colleges. The widespread popularity of Sambataro's original oil paintings is borne out in the fact that Sambataro has sold over 2,500 original works, in addition to over 200 murals. His ability to paint a wide variety of subjects is accounted for by Sambataro's extensive travels on several continents. His noted portraits include those of Lyndon Johnson, John Lennon, Marilyn Monroe, Gary Busey, Barbara Streisand, Paul "Bear" Bryant and John F. Kennedy. Corporate owners include ABC Television, F.W. Woolworth Col., USAF-8th Air Force SAC Division, and the Parker Pen Company.